Start the New Year out right by enjoying wholesome, healthy breakfasts. 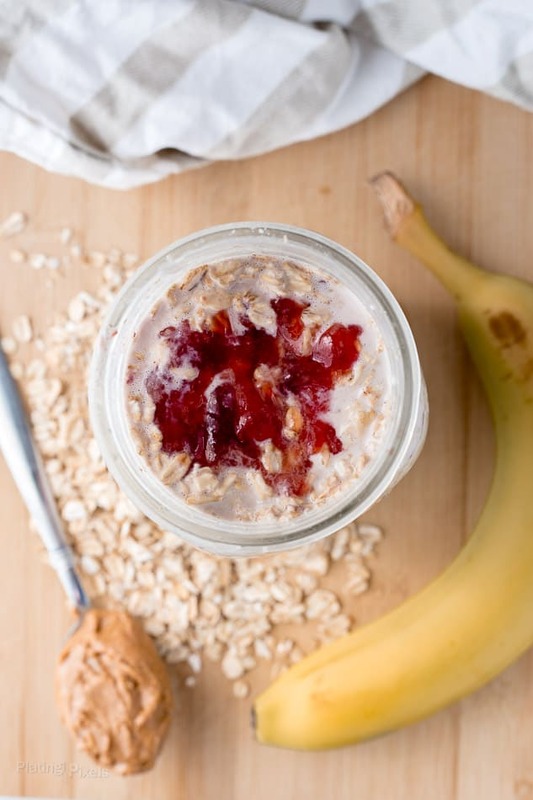 This gluten-free and vegan Peanut Butter and Jelly Overnight Oats recipe is full of complex carbs and protein, with just a bit of sweetness. With the New Year comes the usual new resolutions. The most common ones being losing weight and living a healthier lifestyle. This includes exercising and sleeping better, drinking more water and eating more fruits and vegetables; as well as cutting back on processed food, calories and sugar. Good new is you can enjoy flavorful and wholesome breakfasts like these Vegan Peanut Butter and Jelly Overnight Oats, while still meeting your New Year’s resolutions. Living a healthy lifestyle has been an ongoing commitment of mine, so the New Year won’t change much with my routine. I could benefit from small tweaks and will focus on this more. These include exercising more with 4-5 days per week, cutting back on sugar and simple carbs, and eating more vegetables. Adding any mix-ins such as fresh or dried dried fruits and nuts won’t change the ratio much. For this recipe I used slightly less oats since I like mine with a bit of liquid leftover. Experiment and find your favorite ratio. 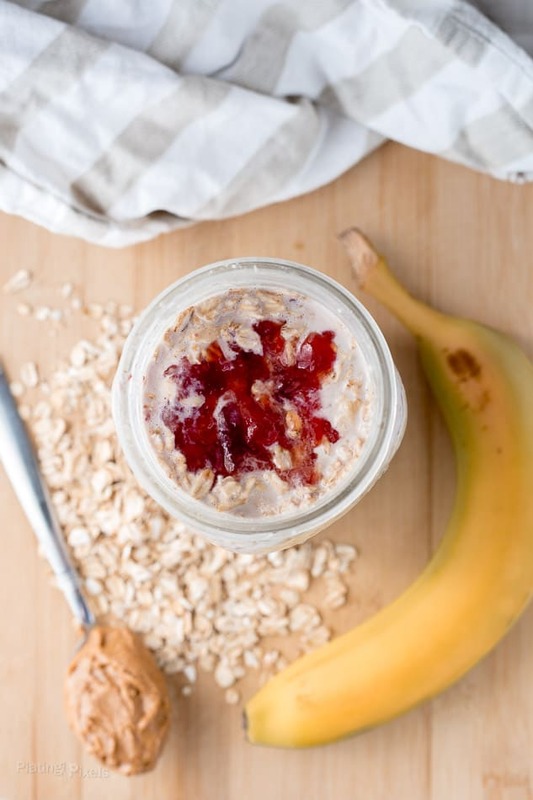 Overnight oats are a simple way to stick with a healthy lifestyle. 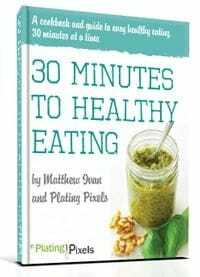 They’re simple to make, save you time by prepping ahead, and are completely customizable with endless possibilities for flavor combos (such as my Apricot Almond Butter or Chocolate Strawberry overnight oats recipes). You can use regular milk, or almond or soy milk for a vegan option. Pick your favorite fruit preserve such as grape, strawberry or raspberry to compliment the peanut butter. 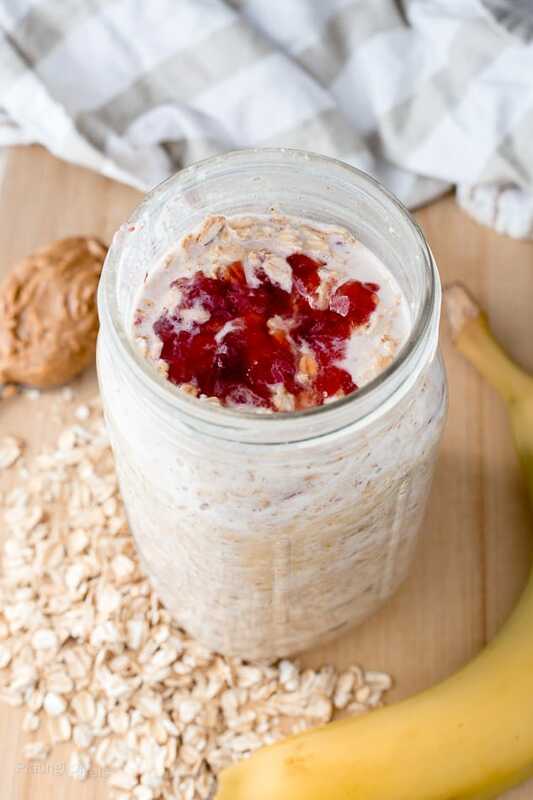 Gluten free and vegan Peanut Butter and Jelly Overnight Oats recipe full of complex carbs and protein, with just a bit of sweetness. Place almond milk, peanut butter and fruit preserve in a 32-ounce mason jar or large container. Seal and shake well to combine. If using a container mix well with a whisk. Add oats and banana and stir to evenly combine. Seal and refrigerate overnight or until oats are softened. Serve cold within 3 or 4 days or heat if desired (I prefer it cold). PB and J in oatmeal! It’s perfect for weekday morning n healthy no fuss stuff! It sure is, thanks Suchi! It took me forever to finally try them but now I’m a huge fan. Thanks Stephanie! You’ve found my weakness – pb&j — seriously, that simple combo gets me every time. I’ve made overnight oats before, but I confess — I always heat them up – there’s something about cold oatmeal that feels wrong, but it’s nothing that a minute in the microwave can’t fix!! Now I’m curious to try them warm, especially in winter time. Thanks for the tip Lisa! I love making overnight oats! And I can never resist peanut butter and jelly! It makes ruinous easy and glad it was helpful. Thanks Shashi and hope you do!